The Body of Christ: Do Christians, Jews, Muslims, and Mormons Worship The Same God? Do Christians, Jews, Muslims, and Mormons Worship The Same God? This is a logical question considering these different 'religions' all claim to come from or 'depend' on the same book, The Torah and mostly the Old Testament. Because they talk of the same "God" does that mean they all believe IN THE God of the Torah and of Christianity? To know this, we need to look at essential characteristics of the god each religion that claims to believe in the same God and then simply compare. Lev 24:10 is the essential rabbinical verse. Modern Rabbis also teach that this has nothing to do with actual belief or even believe in a god to be considered a Jew. Some Rabbis still teach the precepts of the Torah and accepts the “Thirteen Principles of Faith” of Maimonides as requirements to be part of the Judaism but they are the minority. 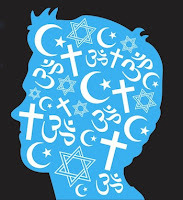 Just like in Christianity and the different denominations; Their are generalized different beliefs within Judaism: Orthodox, Conservative, Reformed, Reconstructionist, and Humanistic. When comparing Judaism to Christianity we see some fundamental differences despite reading the same book. Judaism believes works proceed faith; that they are able to sanctify their lives and draw closer to God by fulfilling mitzvoth (divine commandments). Judaism in the modern era believes no savior is needed or is available as an intermediary. Traditionally they waited for a coming prophet to restore them. They reject Jesus as a prophet. Some sects believe there will be a coming Messiah that will bring all the Jews back to Jerusalem and will rebuild the temple but they are a minority. At best some view Jesus as a good moral teacher. Most believe he is an idol of another religion. Christianity believes Jesus was the not only the greatest foretold prophet but is also God in the flesh. Judaism believe there are 613 commandments found in Leviticus and other books regulate all aspects of Jewish life. The Ten Commandments, as delineated in Exodus 20:1-17 and Deuteronomy 5:6-21, form a brief synopsis of the Law. Christianity believes in 2; Love your God and love your neighbor. With all that said; do they believe in the same God? The answer is extremely easy. No. Because Christianity affirms that Jesus is the Triune God. Judaism rejects Jesus as the Triune God and rejects God as Truine. Thus; a different god. The belief in the Trinity distinguishes Christianity and Judaism at its core. Messianic Jews are the only difference from Orthodox Judaism. They believe and have accepted Yeshua (the Hebrew name for Jesus) of Nazareth as the promised Messiah of the Hebrew Scriptures. They maintain their Jewish heritage and culture but also accept Jesus as Lord and Savior. Messianic Jews and Christians do worship the same God. Muslims claim to also believe in The Torah or the books of Moses but include the Quran also as a holy book. Islam rejects Jesus as the Son of God, as God, and reject that he was even crucified. That he is created and born like Adam and was a prophet. But Muhammad was a greater prophet. Islam is a works based faith. Salvation is based on works. An angel revealed the Quran to Muhammad. Jesus wrote but all his original writings are now lost. They do believe that God spoke directly to Jesus. Jesus then memorized and wrote all that he was told and taught his disciples. But what was taught and written has since been lost and corrupted. Just like with Judaism, Islam is easy to see that they do not worship the same God as Christianity or Messianic Jews. The denial of the divinity of Jesus as the Trinune God proves that they believe in a different god. Chrislam is an attempt to bring together Islam and Christianity. A influential church leader named John Damascene wrote about Islam in 749 AD and made it clear that Islam is a heresy. When comparing Christian and Muslim beliefs, it is clear that Chrislam is a humanistic attempt to appease humanity despite the obvious and historical incompatibility and contradictions. Mormonism teaches God the father is flesh and bone. That God himself was created at one point somewhere else in the universe. Christianity believes God to be eternal, uncreated, immaterial spirit. They also teach that Jesus is created by God as one many spiritual children. Christianity believes Jesus is The One and Only Begotten Son of God. Mormonism reject that Jesus' death on the cross was sufficient to forgive sin. They teach that we must be good and work for our place with the gods. Thus it is a works based religion. Christianity believes that we are saved by Grace through faith. There are three revealed gods but there may be in fact countless amount of gods out there. Mormonism is NOT a monotheistic religion. Thus they deny the Trinity. By comparing Essential beliefs of each religion, it is clear that they are not comparable and do not worship the same god. Again, it is the Trinity that makes the clear separation between the two. The descriptions of God are not the same. Thus they worship a different god than of Christianity. THE TRINITY is the truth that distinguishes the Christian faith from all the other religions. It describes God in such a deep way it makes clear WHO God is and HOW the other religions do not worship the God of Christianity. THE PERSON AND WORK OF JESUS is a defining factor that separates and differentiates the worship of these religions from Christianity. FAITH BASED is the third truth that separates Christianity from these other religions. Christians believe they can not work hard enough or are not good enough. Thus the need for and dependence on the person and works of Jesus. If you notice, THE GOSPEL message of Christianity addresses these three core issues. This is why THE GOSPEL message of Christianity is so important and necessary for worshiping the One true Triune God of Christianity. When people alter and change one of these three factors; you get a new religion who worship a different invented god; such as Islam, Mormonism, Jehovah's Witnesses, Chrislam, and more! A modern movement of "Inter Faith" cooperation is an attempt to bring different religions together. On the surface it seems like a good idea but the problem is that it teaches universalism and the idea that we all worship the same God just with different names is a blind lie or malicious projection of beliefs. Christians are already called to communicate with other religions. But not to make them feel comfortable in their worship of a different false god; but to take God given opportunities to humbly and gently proclaim the Gospel message of the Christian faith. Does that make Christianity an intolerant hateful exclusive religion? That is a closeminded approach to Christianity. 6 Jesus told him, “I am THE way, THE truth, and THE life. No one comes to the Father EXCEPT THROUGH ME"
Interfaith adherents and other religions who claim tolerance and acceptance ironically reject what Jesus proclaims and sadly, not all people will accept him. All of humanity is invited to become Children of God through the person and work of Jesus Christ but not all will accept the invitation that Christ offers. That's on them.